Apple is publicizing another iTunes contest. Like before, they are giving away a prize for every 100,000 songs download or entries submitted. The latter is the typical alternative that all such contests require to claim that they aren’t a lottery or another form of gambling. In this case, the free entry form allows up to 25 entries per day. Apple makes it a little tedious by clearing the form when you go Back to it, so you have to re-enter a ton of personal information each time. They also include a captcha image to prevent automated submissions. That’s all cool, but I’d like it to be just a little easier for me to enter for the free iPod goodness. After you install Greasemonkey, you can find some user script you want to install somewhere on the web and right click to “Install User Script…”. Be careful, of course, because user scripts are NOT SAFE! You need to either understand the code you are installing or trust the person who wrote the script. Save that as a text file called something like foo.user.js and edit it. In Firefox, drag the folder containing that script into the browser pane. You should see a directory listing for a file:// url. Right click on the user.js file and select “Install User Script…”. Then browse to the contest form. Your data should be prefilled. If you need to edit the script, use “Tools > Manage User Scripts…” to uninstall the current version and install the edited version by the same steps as above. Disclaimer: I do not feel that this is cheating on Apple’s contest at all. This script is just a helper similar to form auto-fill. You still have to fill in the captcha manually. This just takes a little of the tedium out of form filling. One of the most popular and highly rated Firefox extensions is the Web Developer extension. This tool adds one or more of the following to every web page: a handy context menu or a toolbar. Both contain the same list of tools that let an experienced HTML coder investigate and manipulate the current page. The total list of features is too long to detail here (you really just have to try a few of them), but I’ll highlight some that I use personally. My favorite feature is the one shown in the screenshot below. The “Validate Local HTML” uploads the page you are currently viewing to a validation service (by default, validator.w3.org). This permits you to test your HTML before uploading it to a public web server, or allows you to validate a page that is hidden behind a login or form submission. Another handy feature for HTML debugging is the Outline control. This submenu allows you to specify any of a variety of HTML entities to highlight. The extension highlights them by drawing boxes around them. The extension also has a few uses for general users. The Disable submenu has options to turn off aspects of annoying pages, like image animations, page colors or even entire styles for the worst-designed pages. The Forms submenu allows you to convert POST forms to GET, for cases when you want to tweak the form values in the URL bar, or bookmark the results of a form submission. The Web Developer extension has quite an impressive array of tricks it can accomplish, all with standard operations. If nothing else it demonstrates how flexible and open a platform Firefox has become. Interacting with the web has gotten more fun in the last year or so. Browser technological improvements seem to be getting a higher priority as Firefox, Safari and Opera are competing to present a superior, standards-compliant environment that benefits both developers and end-users. This means that developers can spend less time working around stupid bugs and more time creating interesting content. This is is marked contrast to five years ago when making a sophisticated website work in both Netscape and IE ususally meant deep sacrifices in functionality, or writing two separate websites. This post, and likely a few more that follow, will detail the Firefox extensions that I consider to be the most useful, primarily to web developers but also to general users. Eventually, I hope to also cover a few that are interesting, but not useful or good enough for regular use in my opnion. This is the first Firefox plugin I ever installed and I still use it routinely today. 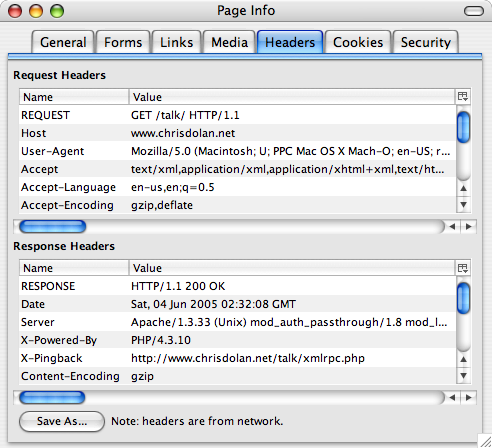 Live HTTP Headers adds a new tab to the Page Info dialog that shows details of the HTTP request/response for that page. To see it, install the extension, visit a page and select Page Info (via the Tools menu, via the context menu, or via Cmd-I on Mac). Then select the Headers tab to see the HTTP headers panel. This panel shows the full HTTP message exchanged between the browser and the web server, less the actual content. This data can be critical for debugging anything deeper than HTML/JS glitches. For example, I maintain the Perl module called CGI::Compress::Gzip which transparently compresses dynamic web content when the browser says that it can support it. I used the HTTP headers to determine what the browser was telling the web server regarding compression — in this case “Accept-Encoding: gzip” was the important one. Then I looked at the web server response, which would tell me the Content-Length (should be smaller when compressed!) and the “Content-Encoding: gzip” message. The HTTP headers can also tell you what web server and platform is being employed at the other end. Finally, you get to see the raw cookie data that went over the wire. but that’s not as real-world as viewing the browser transaction directly. X-Bender: Farewell, big blue ball of idiots!